Rediff.com » Business » Who tipped off bizmen about Nanar refinery project? Two years ago, businessmen from Gujarat came to the Nanar area in Konkan, Maharashtra (bordering Goa) and told local farmers that they were interested in mango farming. They bought land at a price of approximately Rs 300,000 per hectare in 2016. Two years later, a refinery project -- which is being developed by Saudi-Aramco and the Maharashtra government -- is coming up on the same land. 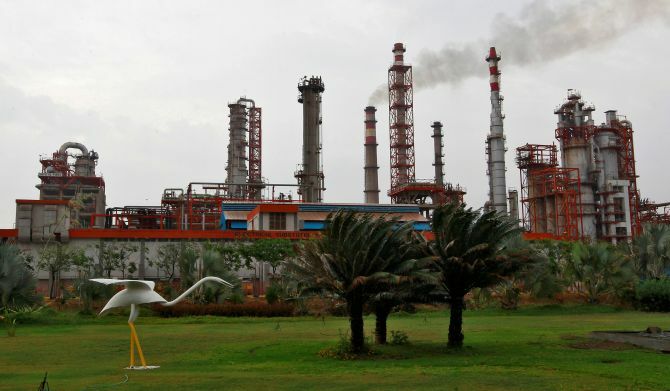 "Each businessman (who bought that land) has made a profit of Rs 97 lakh (Rs 9.7 million) per hectare," says Ashok Walam, who heads the Konkan Refinery Virodhi Sangharsh Committee, an organisation opposed to the refinery. "How did these people come to know about this project in advance? Who leaked them the information?" asks Walam. Walam owns a house and farmland at Nanar and says he is not interested in compensation from the state government, but does not want the project in the area. The Shiv Sena, which is part of the Bharatiya Janata Party-led government in Maharashtra, says it will not allow the project to take off. Walam spoke to Rediff.com's Syed Firdaus Ashraf. Why are you opposing the refinery? We are opposing the project because it will lead to a huge increase in pollution levels in the Konkan region. Farmers in Konkan are very happy. They grow mangoes, jackfruit and several other fruits. We earn good money and also generate employment. Secondly, we do not want to destroy the green cover in Konkan. How many people will be affected by the project? As many as 42,000 people will have to shift from 17 villages in the area. Scientists say if this refinery -- which will be the world's largest refinery -- comes into existence, it will pollute areas as much as 350 km away. Therefore, we are opposing it. The government must have commissioned the project with some thought. What thoughts? Go to Chembur in Mumbai. There are small refineries and it has caused great destruction to the local population in terms of health. The project will create jobs. The government must have taken due environmental precautions before going ahead with it. The government says they will employ one lakh (100,000) people but we already provide jobs to more people in the farming sector here. People from as far as Nepal come to Konkan to work. If the government wants to set up a refinery, why don't they set it up where farmers are committing suicide? No Konkan farmer has ever committed suicide. They never agitate for better crop prices too. So, why does the government want this refinery here when the people think otherwise? We didn't demand compensation from the government even when our mango and cashew crops failed. There must be some reason for the government to build this refinery in Konkan as it is close to the Arabian Sea. The only reason is they want many refineries in India. We went to Jamnagar in Gujarat and found out how people are troubled with the refinery project. When the government brought the nuclear project to Jaitapur (in Konkan), there was no large-scale protest so the government thought they can bring the refinery project too. Where will the carbon emissions from this project go? The government is only thinking of investment, but what about the future of our children? It says this project will improve our lifestyle, but what about our lives? We do not want this project at the cost of our lives. Take the Jaitapur nuclear power project. There, 213 families got compensation. After nine years the government says they were paid too much and they must return some money. As they could not return the money, the government sealed the bank accounts of these poor villagers. Why is there a hue and cry about investors from Gujarat putting money into this project? Any Indian can buy any land anywhere in India. But in this case, these Gujarati businessmen had prior knowledge of this project. Farmers of Konkan had no idea about this project. These Gujarati investors came and told farmers they want to invest in mango and jackfruit farming. Government people tipped these Gujarati businessmen in advance about the petrochemical project. Farmers sold their land at Rs 3 lakh (Rs 300,000) per hectare. Now that has gone up to Rs 1 crore (Rs 10 million) per hectare after the project was announced. While the businessmen have no problem with the project, the locals do not want it. And look at the other angle. These businessmen made a profit of Rs 97 lakh (Rs 9.7 million) per hectare. So there is a big gameplan. There are 17 villages. 228 Gujarati and Marwari businessmen have invested in the land. We have now got details about them. Many of these people are from Mumbai, Uttar Pradesh and Rajasthan. One investor told us he is scared now as he is a family man. He said one leader in Gujarat had sent him to Konkan to buy land. Do you see corruption in the deal? The government knows about all upcoming projects, and it has to keep that information confidential. Ministers take oath of secrecy. We feel there has to be an inquiry on this issue. How did these people come to know about this project in advance when locals didn't know? It means those who are running the country are somewhere interested in selling the country's resources to private businessmen. The Shiv Sena has come out on your side. Earlier, they were not on our side as their people had land in that project. Now they have also come. Do you feel THE Shiv Sena's support will ensure scrapping of the project? This project will not come up irrespective who says what. The farmers of Konkan will not allow this project to start. If they want to bring this project, then 75 per cent of farmers must agree according to the (land acquisition) law of 2013. Right now, only those investors have given a nod for this project and they hold 8 per cent of land of the total project. There has to be an inquiry when these people became farmers. It seems farmers don't want to give up farming in Konkan. One hapus mango tree earns a farmer Rs 50,000 yearly. There are thousands of mango trees in Konkan. I myself stay in Mumbai and earn Rs 6 lakh (Rs 600,000) yearly from mango trees. So why should I give up my land? We are also generating employment in Konkan. So, why do they want to destroy Konkan? They will destroy 12.5 lakh (1.25 million) trees for this project. I personally went to people's homes before the elections and told them to vote for the BJP. I wanted the BJP in power in 2014, but I don't know what has gone wrong with them. Did you meet Chief Minister Devendra Fadnavis? I met him four times. In March we staged a huge dharna at the Azad Maidan in Mumbai and he had called us for a meeting. He gave us a false assurance that the government will cancel the project if the farmers do not agree. Later, he signed an MoU (Memorandum of Understanding) with the Saudi Aramco company for this petrochemical project at Nanar in Konkan. This project will bring huge investment to our country. (Union Minister) Nitin Gadkari said three days ago that we don't need another refinery. Our country needs only 19,000 crore tonnes of oil and we are already producing 24,000 crore tonnes. We export the rest, so why do we need another refinery? Exports are good for the country. Yes, it is good. But tell me, why have 196 countries who signed the Paris agreement said that such projects must never come up? In the United States and Japan, they are shutting down refineries as they know it is bad for the environment.